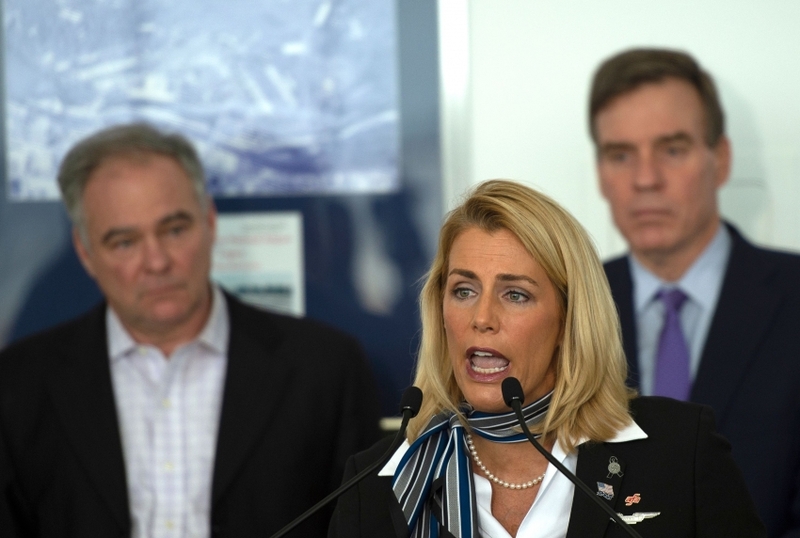 On Sunday, January 20, speaking at an AFL-CIO dinner honoring Martin Luther King, Jr, Sara Nelson, president of the Association of Flight Attendants (AFA-CWA), called for a general strike to end Trump’s government shutdown. The following Friday, Nelson, a United Airlines flight attendant since 1996, told the media that flight attendants were “mobilizing immediately” for a strike of their own. A couple hours later, President Trump agreed to provisionally reopen the government for three weeks. Nelson’s power moves have a backstory — and a future. She was raised to serve the public, in Corvallis, Oregon, in the 1970s and 1980s, an era when the earning power of public servants had already begun to wane. Her mother was a teacher, but her father, though trained as a physical education teacher, never found a job in that field due to budget cuts in the public school system. He worked first in a lumber mill, then selling lumber. In college, Nelson majored in English and education. She did her student teaching in inner-city St Louis. “I really would have loved to be a teacher,” she said. But she struggled to make ends meet after graduation, facing student loans. One of her best friends became a flight attendant. “We sort of thought it was funny, and that she would do it for a year or two,” Nelson recalls. Not long after, her friend called from a beach in Miami, toes in the ocean, announcing firmly that it was time to stop laughing at her new career: among other benefits and perks, the money was better than Nelson’s first-year teacher salary. Nelson’s union, the Association of Flight Attendants (AFA-CWA), which today represents nearly fifty thousand workers at twenty airlines, had an impressive history even before she joined. In the 1980s and 1990s, airline deregulation brought vicious assaults on labor. After Carl Icahn fired all the TWA strikers in 1986, he showed that flight attendants could be replaced within a few days. “We had to be able to fight back,” Nelson emphasizes. In response, AFA created a strike tactic called Create Havoc Around Our System (CHAOS), whose guiding principle is that “the strike is going to take any form and we are not going to give you any warning,” Nelson explains. CHAOS is deeply destabilizing to corporate management. “It could be a single flight, where there is no replacement. It could be shutting down an entire airport, or it could be everyone walking off the job for an hour,” says Nelson. “You don’t know where or when. And the effective result is that we control the schedule.” Alaskan Airlines’ executives were once driven to such confused desperation by CHAOS that they inadvertently gave many employees a 60 percent raise overnight. “There are no labor rights without the right to strike,” says Nelson. “You can’t have a collective bargaining process without the right to strike.” The reason is that without that threat, management has no incentive to reach an agreement with workers. When Ronald Reagan famously fired the striking air traffic controllers in 1981, he knew this, and his move had just the consequences that he and his right-wing backers desired. Making it harder for workers to go on strike has immeasurably complicated their efforts to build and exercise power, and union membership has steadily declined. I ask Nelson what she and her members plan to do with all this power. “We cannot take day thirty-six of a lockout,” she insists quickly, explaining that the AFA-CWA is now wholly focused on preventing lawmakers from shutting down the government again when this temporary truce expires. “We are getting ready to take very fulsome action on February 16 to define what’s at stake if they don’t get to the table and resolve this,” she emphasizes. Liza Featherstone is a staff writer for Jacobin, a freelance journalist, and the author of Selling Women Short: The Landmark Battle for Workers’ Rights at Wal-Mart.